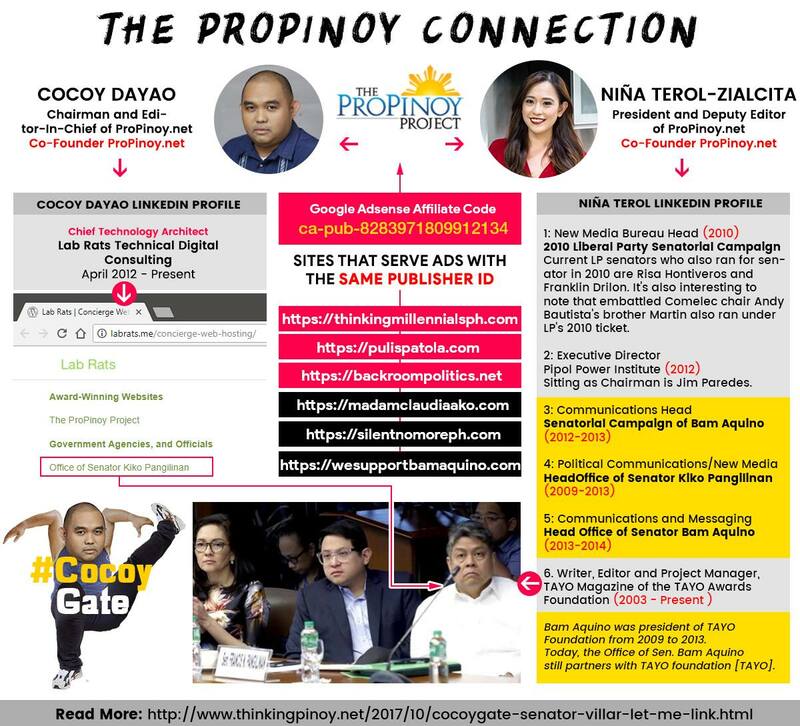 In last week’s “#CocoyGate: Senator Sotto, here’s the guy you’re looking for”, I explained how several opposition-aligned websites share a common webmaster: Edward Angelo “Cocoy” Dayao, practically uncovering a massive anti-administration propaganda machine. In that article, I looked into the Google Adsense advertisements served in these sites and compared them to the advertisements served in websites known to be owned or controlled by Dayao. That is, I showed that Dayao’s Propinoy.net uses the same Google Adsense Account as SilentNoMorePH, MadamClaudiaAko among others. Moreover, I showed that Dayao’s PinoyAkoBlog uses the same Google Adsense Account as ChangeScamming, BackroomPolitics among other. As the article went viral, several opposition bloggers have come to the rescue, arguing that Dayao is just a domain reseller who has nothing to do with the day-to-day operations of these websites. Domain resellers do not inject their own advertisement codes in the domains that they sell. Moreover, the fact that Dayao earns money from those websites on a continuous basis is sufficient proof of Dayao’s complicity in their operations. Besides, why would a website owner let go of website revenue, no matter how small? Adsense can be set up to do automatic bank deposits, so why would a website owner ignore such a revenue stream that basically doesn’t require a lot of maintenance? Moreover, for the sake of argument, isn’t it too coincidental that all of these sites were sourced from the same person? Assuming for the sake of argument that the anti-administration websites are operated by independent entitites, it’s likely the somebody must have referred those entities to Dayao. Well, Dayao owns the single-proprietorship IT consulting company “Lab Rats Technica” [SHC] and according to Lab Rats’ website, Cocoy created the website for the Office of Senator Kiko Pangilinan [LabRats]. But is that the only connection? Sounds pretty thin to me. And that, my friends, is what I’ll explore further in this post. I myself do not believe that Cocoy generates content for all these sites on his own: there’s so many, it’s humanly impossible. Thus, I felt that the next logical step is to do some online sleuthing to check for other potential conspirators, i.e. other potential suspects. Now, the photo in itself is insufficient proof, but it does raise reasonable suspicion, so I dug even deeper, and I found an interesting connection.Recall that that the infamous SilentNoMorePH and ProPinoy share the same webmaster, Cocoy Dayao, and that Dayao calls himself the “chairman and editor-in-chief” of ProPinoy. Interestingly, ProPinoy was co-founded by Cocoy Dayao and a certain “Niña Terol”. Let me repeat: we have shown in last week’s article that whoever is behind ProPinoy is also behind SilentNoMorePH and so far, we know that Cocoy is it’s chairman and editor-in-chief. Now, according to her CNN author bio, Terol is a co-founder of deputy editor of Pro-Pinoy [CNN]. More specifically, according to her personal blog, she is the President and Deputy Editor of ProPinoy [Terol]. But wait, there’s more! I checked Niña Terol’s [LinkedIn Account] and if Terol somehow decides to take it down, you can find a saved PDF printout by clicking here. Current LP senators who also ran for senator in 2010 are Risa Hontiveros and Franklin Drilon. It's also interesting to note that embattled Comelec chair Andy Bautista's brother Martin also ran under LP's 2010 ticket. A nonprofit that is “dedicated to the full realization of People Power in the national life and in the international arena [PPI FB]”. Sitting as Chairman is Jim Paredes. Terol said her “high-level tasks include communications planning and execution, messaging and branding, networking, (and) liaising”, among others. She “headed overall communications, messaging, and digital operations”. Bam Aquino was president of TAYO Foundation from 2009 to 2013 [Senate]. Today, the Office of Sen. Bam Aquino still partners with TAYO foundation [TAYO]. I don't know but isn't the link too obvious? It was practically LP, especially Bam and Kiko, who built her career. She worked as Kiko's New Media (READ: Social Media) head for FOUR YEARS for crying out loud! I have shown in the previous article that Dayao has sufficient technical know-how to set up the websites, but he doesn't have the communication skills to complete the formula... ...and Terol, Dayao's close associate, can provide that. But Terol is not just any other social media marketing specialist. 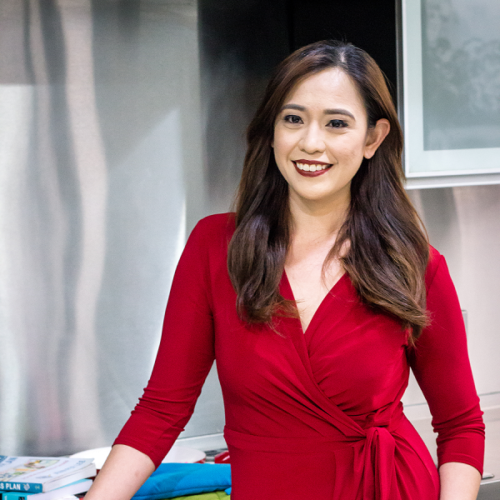 She is someone whose skills were honed during her lengthy stint as a "New Media Head" for Bam Aquino and Kiko Pangilinan and the rest of the Liberal Party. Should Sen. Sotto also ask NBI Cybercrime Division to investigate Terol?